Every year, my company has a Thanksgiving dinner for our employees. The company buys the Turkeys (four this year!) and some sides, and every else brings a dish. There is A LOT of food! This year, I decided to give cupcakes another go. I really wanted to make them look like mums but when I opened my new pack of icing tips I realized I didn't have the right one. I also couldn't get the icing as dark as I wanted! 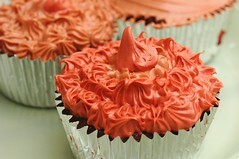 Anyone know how to make deep colors with icing?? But in any case, I posted the pictures to my flickr account so head on over and take a look! They are red velvet cupcakes!